Rules: Use the Rafflecopter form to enter daily. Giveaway ends 1/20/15 and is open worldwide. Winner will be notified via email. Just in time for the holidays, Cricut has some of the best deals of the year right now! From an extra 20% off new sale items, to free shipping, and even 35% off digital products, the deals going on now at Cricut.com are too good to miss! These great deals expire soon, so be sure to check them out today! You can also get 35% off all digital products, plus free standard shipping, at Cricut.com with Code 35DIGITAL through 12/15!! With so many of us working from home, it’s important to have an office space that inspires us to be productive. We need the right furniture and the right technological equipment. But thanks to Groupon Coupons, we don’t have to pay full prices to get the essentials. And at Sam’s Club, there are a wide range of products to make our home offices flourish. Here are a few basics for every home office. The pride of every home office is the computer. And in this world of high technology you need it to have quick speed internet access and e-mail. And if you have to travel, consider adding a laptop or similar device to the mix. Get a desk that’s the right height for your eyes, neck and head, and a chair that provides good support for your back. Sam’s Club has a lot of different options. You can access these with your coupons. Get a feel of what’s on offer before making your final choice. If your desk and chair are not welcoming, you won’t spend much time in your fancy workstation. Invest in file cabinets for neatly storing your documents and a series of shelves for holding your books and other reference material. The surge protectors safeguard your computer and its support equipment from damage when there’s a sudden power surge following a power failure. Backup equipment will also automatically save your work and close down your equipment when the power suddenly goes off. A multi-task printer allows you to print, fax, photocopy and scan all at once. The less standalone units, the better. You don’t want an office that’s cluttered. Plus an all-in-one reduces the number of cables you can trip over. You need a fireproof box for storing and protecting your most important business work and also your backup copies. Working at home can be great when you have all the essentials for optimal performance. But treat it like you would, an away-from-home office. Keep information confidential and keep the kids out. Are there other items you find essential for your home office? Shaw’s & ACME Grocery Stores want you to make your money work for you this holiday season. With their offer, you’ll end up with more money in your pocket to spend on groceries and/or put back in your pocket. The key to putting more money in your pocket is to buy the gift cards before you go shopping, out to dinner or shopping for the holidays, but especially before you shop for groceries. You can end up saving up to 18%! Earn a Coupon: Buy $125 or more in select gift cards, and receive a $15 coupon for your next purchase of $25 or more at Shaw’s and ACME grocery stores. Use your favorite rewards credit card to purchase the gift cards, you can earn points, miles or a percentage back on your purchase – depending on what your rewards credit card offers. There are some credit cards even offer increased rewards for purchases made at grocery. For example, the Blue Cash Everyday® Card from American Express offers 3% cash back on groceries, and the Blue Cash Preferred® Card offers a whopping 6% cash back! Capital One QuicksilverOne®, AMEX EveryDay® and Citi® Hilton HHonors credit cards also offer increased rewards for grocery purchases. $22.50 in savings on a $125 gift card purchase! Some credit cards may have limits on the rewards you can earn at grocery. Think of all the people you can cross off your Christmas List that you need to buy for. Gift Cards are practical gifts for students, teachers, neighbors, stocking stuffers, friends – just about anyone! Have a birthday coming up right after the holiday – now would be a great time to buy for that! Enter to win a $50 Amazon Gift Card. Open to the US only. Entry is simple – Rafflecopter powered. **This post/giveaway is Sponsored by Tatu Digital Media. FCS is not responsible for prize shipment. Ebay has been around for years and provided people all over the world a way to sell their old items. Basically, it’s a virtual garage sale, and many people have found success in selling items or locating something that they truly want/need. While Ebay is a garage sale of sorts, it doesn’t always mean you’ll automatically find the best price. Sometimes, you have to work for it. Check out the following tips that can help you save money on your next Ebay purchase. Like you would do in a normal purchasing opportunity, it’s important that you shop around. It’s possible that there are multiple people on Ebay selling the exact same thing, and chances are, one of them will have a lower price than the others. This is why it’s very important that you shop around on Ebay. Look up the item you want and scan through all the offerings that are available. You should also consider changing the name or phrasing that you search for, as this could help you get more results. For example, if you’re looking for a Teenage Mutant Ninja Turtle spoon, you can type in “Teenage Mutant Ninja Turtle Spoon”, “Ninja Turtle Spoon”, “TMNT Spoon”, and you can even replace “spoon” with “silverware” too. Doing this will allow you to see everything you may want and then compare prices. Ebay allows you to sign up for a Daily Deals newsletter that will send you information on all the best priced items for that day. This is a great way to find all the best savings without having to do too much research on your own. Plus, most Daily Deal specials come with free shipping, which means you get even more bang for your buck. You can always sign up and check it out, and if you don’t like it, simply remove yourself from the list. Most people don’t realize that Ebay coupons exist, but they do. Finding and using these, as well as Ebay discount coupon codes, are great ways to buy the item you truly want for an even lower cost. These coupons and discounts will vary all the time, but saving anything from 10% to free shipping is a great way to save some dough. Make sure that you always do a little digging before buying to ensure you have the best possible savings. Ebay allows you to communicate with a person selling an item. This can be extremely helpful when looking to save money. Pay close attention to the amount of time that an item has been on Ebay, and also do some research to see what the item typically goes for. Then, use this information to reach out to someone and ask if they’d be willing to sell you the item for a lower price. If a seller hasn’t had any luck getting rid of an item, they may be willing to let it go for less just to get rid of it. Not every seller will always agree to the lower price, but it’s always worth asking. You can think of Ebay as a giant shopping network. Sometimes sellers have a theme to the items they sell. If you notice that one person sells items you love, build a relationship with them. This way, when they have something new you may be interested in, they’ll reach out to you. Also, if you have a history of buying from the same person, they may be more inclined to give you a discount on the item for your repeat business. Whether you shop on Ebay often or barely use it, having these tips in your back pocket will allow you to get the most out of Ebay without spending a fortune. Do you have any tips on how to save money on Ebay? Vapes seem to be on everyone’s Christmas list. The hottest item since cell phones, new models and natural flavors are always being talked about. The requests seem simple enough. Find out the type and the flavor, then visit a Vape Shop. Wrong. Vapes have become an industry all their own. There are literally hundreds of choices, with or without temperature options, dry herb or liquid, and on and on. Where do you start? Then there is Charlie. He doesn’t smoke at all! What’s up with him wanting a Vape? To vape his coffee, he says. Are you kidding me? I think it’s time to read up on this latest fad or everyone is going to end up with a pair of house slippers. Electronic cigarettes, or e-cigs, were created as an alternative to cigarettes. When exposure to second-hand smoke became an issue in public places, ingenious companies went to work to side-step the issue. The e-cigarette was born. As with all new discoveries, bigger and better was now the focus and vaping evolved. The Government argues that while e-cigs do not deliver second-hand smoke to people around you, they still have similar ingredients of cigarettes. Carcinogens and toxic chemicals (such as formaldehyde and acetaldehyde)have been found in most e-cigs, in addition to addictive tobacco. In Advanced Personal Vaporizers, or vapes, one has the ability to control the percentage of nicotine from very high to none at all. The most prevalent ingredients consist of Propylene glycol (an ingredient found in asthma inhalers), vegetable glycerin, propylene glycol, and the yummy flavorings. This news is quite different than what most people are led to believe, but always ask for a list of ingredients. Some manufacturers are not as ‘clean’ with their products as others. This should make anyone feel better about buying a holiday gift that is questioned as harmful. Now, the next problem is how do you select a good and trusted vape? There are over 250 styles of vapes on the market. The look seems to be by personal preference and a trip to a local Vape store may be warranted. The salespeople can offer assistance in the age group and best sellers for vapes in your area. Next, the important part. The e-liquid comes in many different flavors and different percentages of nicotine included. The lower the nicotine contained, the better the flavor, say many savvy vapors. Everything from vanilla to pumpkin pie can be purchased as a flavor. Believe it or not, the flavor and the vapor seem to win hands down over the amount of nicotine contained. If you do not feel comfortable in purchasing this new contraption and selecting flavors, go for a pair of PJs, a T-shirt, or coffee cup that advertises the fact that your gift recipient is a vapor. Or play it safe and hand out gift certificates. Maybe a combination of a gift certificate and a designer vape water bottle would be a pleasant surprise. Whatever your decision, now you know what vaping is all about and you can rest easy that vaping is not a bad thing. In fact, those tantalizing flavors sound so good that you may end up buying one for yourself. This guest post is courtesy of MightySkins, an American owned, operated and manufactured custom skin company that features ipv4 wraps and ipv3 wraps for vaping products as well as many other electronics including phones, tablets, laptops and game consoles. Just in time for the long cold days of winter. Can you see yourself curled up on the couch watching TV, or reading a good book all while being jamatized in a comfy set of pajamas, all day long, while the snow falls from the sky? How relaxing! With that being an envisionment in your mind – take a chance at winning one of 21 pajama prizes in this pajama giveaway. 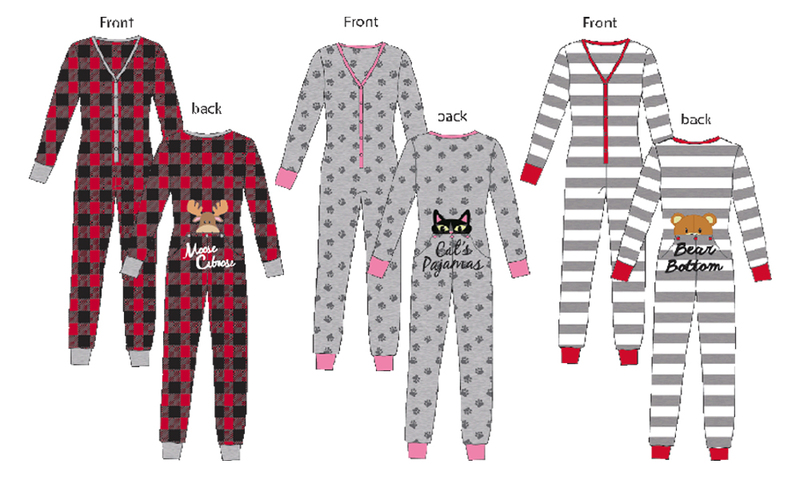 Welcome to the Women’s Onesie PJ Wardrobe Giveaway Event! You may have seen all of the super-cute PJs at Walmart recently; Chances are they are from Richard Leeds International, and these PJs certainly fit the bill of cute! 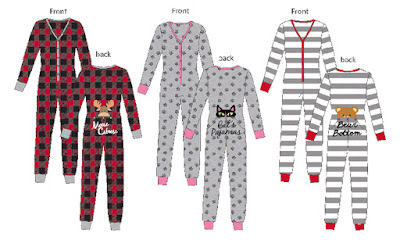 These 3 styles of one-piece PJs will keep you warm and snuggly all winter-long! Read Holly’s full review here. If you’re looking for a cute print with a twist, these One-piece drop-seat PJs will keep you warm. They’re available in Moose Caboose, Cat’s Pajamas, & Bear Bottom. Giveaway begins on 11/18/15 at 1:00 am CST and ends on 12/9/15 at 11:59 pm CST. Must be 18 years or older, open to residents of the US only. Once confirmed, the winners will be added to the Southern Mom Loves Winner’s List. Disclaimer: The participating blogs were not compensated for this post, including Finger Click Saver. No purchase is necessary to enter. One entrant per household, per address. All entries will be verified. Void where prohibited by law. Winner will be notified by email; Please add southernmomloves@gmail.com to your whitelist. Richard Leeds International will be responsible for prize delivery to the winner. This giveaway is in no way administered, sponsored, endorsed by, or associated with Facebook and/or Twitter, Google, Pinterest, or any other social media platform.